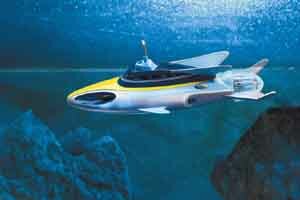 Vivid Imaginations has launched a 9" long Stingray featuring two firing torpedoes and a wind-up motor. The craft also includes a mini Troy Tempest figure - all this for £13. And best of all, it's really accurate and extremely well made. Frankly, it's a bargain. Bath time will never be the same again. although I'm no sure I'd want a Terror Fish swimming around by the plug. So it's three cheers for Vivid Imagination who has once again come up trumps. It's rumoured that the production run will be limited but I'm not sure I believe it.